The Earth is being continuously bombarded by high energy particles from deep space. The particles are mainly high energy protons together with a small component of helium nuclei, heavier nuclei and electrons. The energy range is enormous with some particles having energies of the order 1020 eV. 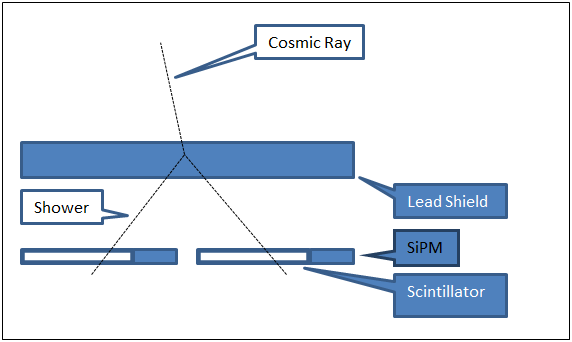 These primary cosmic rays hit the Earth at a rate of about one particle per square centimetre per second. They collide with atoms in the atmosphere and produce large showers of newly created secondary particles the progeny of which can be detected at ground level. The initial interactions in the upper atmosphere produce large numbers of charged and neutral pions. 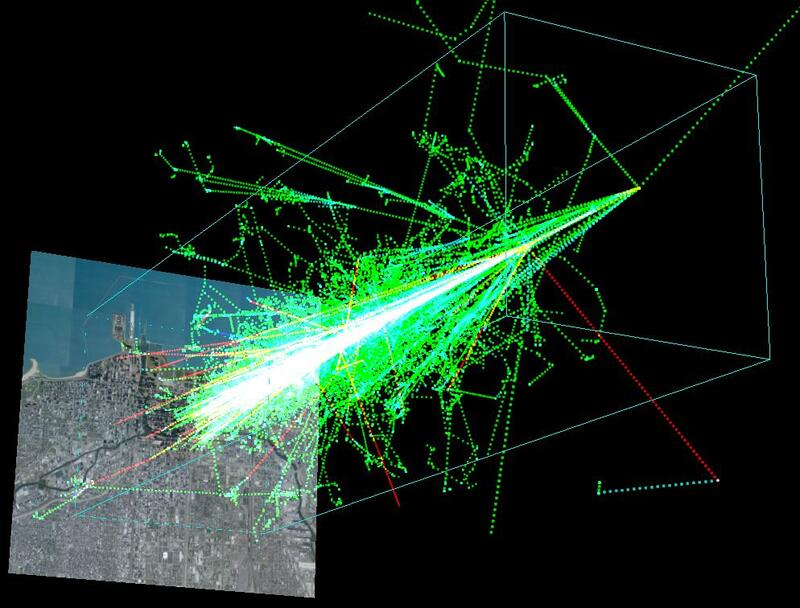 The charged pions decay into muons and muon neutrinos whereas the uncharged pions decay into pairs of high energy photons which become the starting points of large cascades of electrons, positrons and gamma rays. The resulting flux of particles at ground level consists mainly of these muons and electrons/positrons in the ratio of roughly 75 to 25 percent. The muons lose their energy gradually by ionisation of the material through which they pass. As they start with high energies they have the capacity to ionise many atoms before their energy is exhausted. Also, as they travel at nearly the speed of light, they tend not to ionise very efficiently and hence can travel through substantial lengths of matter, some metres of lead, before being stopped. The process is a little different for the electrons. Theory shows that ionisation of the medium is not the predominant energy loss mechanism for relativistic electrons, high energy electrons lose energy more efficiently through the emission of electromagnetic radiation as they are decelerated in the presence of matter. If ionisation had been the main mechanism for slowing the electrons down then they might have had penetrative properties comparable to those of the muons, but the radioactive energy loss mechanism ensures that about 15cm of lead is sufficient to stop them. The different energy loss mechanisms allow the sea level particle flux to be split into two main components. The penetrating muon part of the ground level flux is referred to as the ‘hard’ component and the easily absorbed electron part is called the ‘soft’ component. The decay of a neutral pion into a pair of high energy gamma rays is the starting point of an avalanche of electrons, positrons and further gamma rays. This avalanche is known as an electromagnetic cascade. The process starts when one of the gamma rays passes close to the nucleus of an atom. Even though the gamma ray carries no electric charge its electromagnetic nature allows it to interact with the strong electric field of the nucleus to cause the materialization of an electron-positron pair. The energy required for pair creation is about 1 MeV, the gamma rays can have a thousand times that energy and hence the electron-positron pair produced can move on sharing nearly all the energy of the initiating gamma ray. If these fast moving electrons and positrons go on to pass close to other nuclei then they will suffer accelerations due to the positive charge of the protons. An accelerated charged particle will emit electromagnetic radiation. The intense accelerations can produce further gamma rays capable of producing more electron-positron pairs. The cycle of pair-production and gamma ray generation continues with the original gamma ray energy eventually manifesting itself as many particles. The process is shown schematically in the figure below. The cascade generation ceases when the shares of energy get sufficiently small such that the electrons are no longer capable of radiating efficiently; the relatively slow moving electrons are then brought to rest by ordinary ionisation processes. The electron energy at which the main energy loss mechanism changes from radiation losses to ionisation losses is known as the critical energy Ec. The critical energy for electrons in lead is about 7.6 MeV. Whilst the electromagnetic cascade can grow over a large distance in air it is confined to much smaller regions in solids where the number of atoms per centimetre path length is greater. If the material is made up of atoms with a high atomic number then the greater nuclear charges can produce greater accelerations and so the cascade process can develop more readily than it would in a material with a lower atomic number. In his 1964 popular account of the historical development of the understanding of the nature of the cosmic radiation, Bruno Rossi describes the crucial experiments that led to today’s picture. He recounts how, at the age of 24 in 1930, he built his own Geiger-Mueller counters and developed vacuum tube coincidence electronics to enable him to use groups of GM tubes in an investigation into the cosmic ray penetration of dense materials. He found that a substantial proportion of the cosmic radiation detected at sea level could penetrate over 1m of lead. About the same time, investigators using cloud chambers reported observations of multiple tracks associated with the apparent generation of secondary particles close to the walls of the chamber. Rossi pursued this by using a coincidence arrangement of three GM tubes in a triangular array within a lead enclosure in order to record the generation of groups of particles. The arrangement is shown in the figure below. A triangular arrangement was used to cut out the possibility of a single particle discharging all the counters at the same time. He was surprised to record a high rate of coincidences, as many as 35 per hour in some cases. 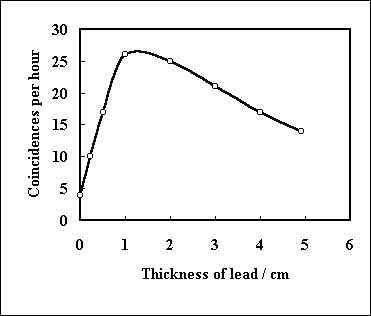 When the upper part of the lead shielding was removed the coincidence rate fell to about 2 coincidences per hour. Even this lower coincidence rate was surprising since counter statistics associated with random coincidences predicted a much lower value. The background coincidence rate can now be understood in terms of showers of particles produced in the air above the counters. The rapid fall-off of the coincidence rate beyond the peak of the shower curve made it clear that the particles responsible for the production of the groups of particles were not the same as those capable of penetrating 1m of lead with ease. The explanation of the processes involved in electromagnetic cascades developed in the years that followed. Dirac had already predicted the existence of positrons and Carl Anderson produced cloud chamber evidence of positive electrons. In 1934, Hans Bethe and W. Heitler considered in detail what happened when a charged particle passed through the strong electric field of an atomic nucleus. They found that, at high energies, the particle is likely to release a large fraction of its energy as a photon. The picture of the deceleration induced emission of high energy gamma rays (called bremsstrahlung – or braking radiation) and the subsequent materialization of an electron-positron pair (pair production) began to develop. The theory enabled physicists to calculate the typical numbers of electrons and positrons likely to emerge below a given thickness of lead when a relativistic charged particle or a high energy gamma ray entered it from above. The analysis of many sets of experimental data showed that the cascade theory adequately explained the features of the showers. Using two plastic scintillators coupled to silicon photomultiplier (SiPM) and the coincidence circuit we tried to reproduce the experiment of Rossi on electromagnetic cascades. 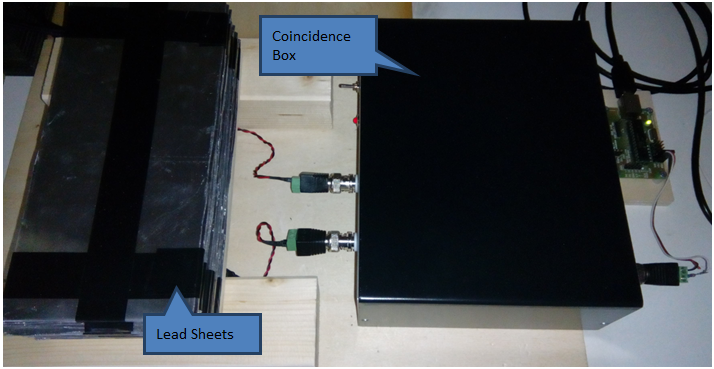 The devices are the same as described in the post Cosmic Rays & Scintillation Coincidence Detector. The plastic scintillators are placed side by side, above is placed a lead screen which consists of a number of sheets with thickness of 1.2mm, the plates have been grouped in groups of 4 so as to have the lead shielding with thickness of 4.8mm. The scheme and images below describe this setup. 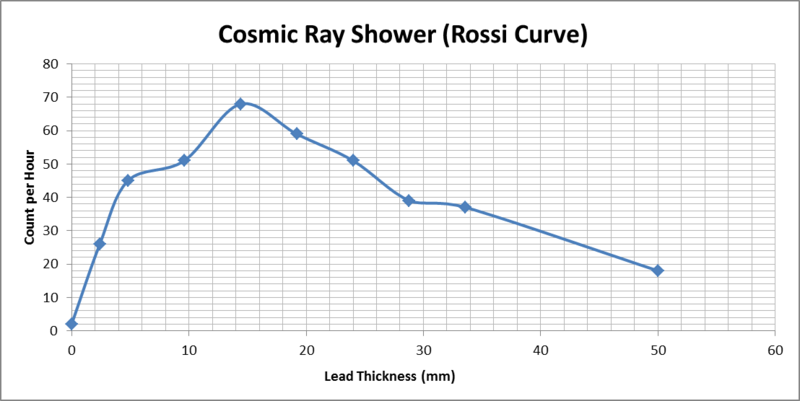 As can be seen the agreement with Rossi curve is great and the maximum of the count is achieved for a thickness of about 15mm, the background value is low but not zero because of the cosmic showers generated into the atmosphere. Using the theoretical model of this interaction (which is not described here) one can derive the average energy of the incident particles that give rise to electromagnetic cascade. From the experimental data obtained you get a value of about 70MeV.